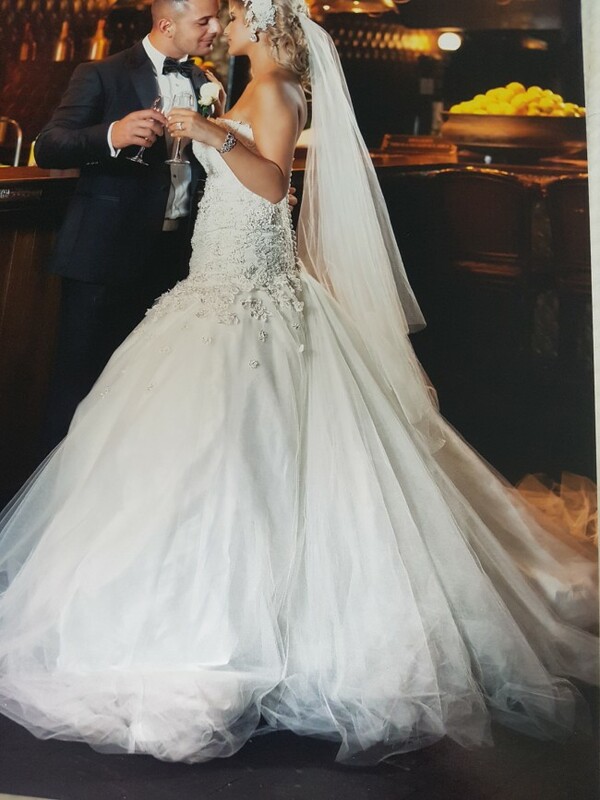 A beautiful custom made liade couture dress size 10 with all French lace and layers apon layers of tulle skirt all hand beaded heavy through the bodice and nicely blended into the skirt all beading was done with sworofski crystals and white water pearls. The back of the dress has beautiful vintage buttons and the train of 2.5 meters long can be hung onto the buttons if you like or on the finger. This dress is so beautiful on the pictures don't do it justice it fits like a glove it was very comfortable to wear all day and night it's modern with a hint of vintage and bling of course. Once you send a message, Constance can invite you to purchase the dress.